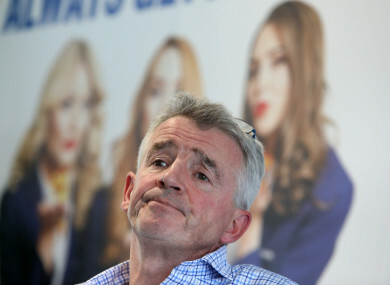 RYANAIR CEO MICHAEL O’Leary has said the low-cost carrier may take a week of holidays from its pilots in an effort to prevent further flight cancellations due to a staff rostering “mess-up”. The airline boss made the comments today at Ryanair’s annual general meeting, which took place against a backdrop of threatened work-to-rule action by pilots - which O’Leary has denied - and a controversial decision last week to cancel thousands of flights. A large number of pilots are due to take four-week blocks of holidays over the coming months due to a self-described “mess-up” in Ryanair’s staff rostering department as the airline prepares to make changes to its calendar year. Fora was denied press accreditation to attend the AGM, but other outlets report that O’Leary said Ryanair may force hundreds of workers to take three-week holidays instead. The additional week off would be postponed until 2018. He said the airline doesn’t need agreement from pilots for such a change. The BBC reports that O’Leary said some pilots have been offered a €10,000 pay rise if they offer to help out. However, Ryanair’s earlier offer to pay up to €12,000 to pilots has been rejected by a number of workers. In a letter sent to management and seen the by the BBC, a group representing staff at 17 of the company’s 80 European bases told Ryanair management that the majority of workers were not impressed with the offer, and are thinking about taking industrial action. Captain Evan Cullen, president of the Irish Air Line Pilots’ Association (Ialpa), told RTÉ’s Today with Sean O’Rourke that the union wasn’t involved in this work-to-rule threat, and stressed that it was the airline who was cancelling flights, not pilots. He said that Ryanair pilots have been in contact with Ialpa, but there has been no official call for industrial action or mediation so far. “It’s very important that it’s made clear that Ialpa has no hand, act, or part in any industrial action or threatened industrial action in Ryanair. The reason why I’m here and you don’t have a Ryanair pilot here is because most Ryanair pilots feel they won’t have a job by the end of this interview if they came in here. He said that the problems that have contributed to thousands of flights being cancelled over the next six weeks weren’t new, and have been going on for years now. Earlier this week, Ryanair chief operations officer Michael Hickey asked pilots to work through their assigned holiday days in order to “avoid further cancellations” in exchange for a cash bonus. The bonus would be paid next November providing the pilots were still working at the company and flown more than 800 hours for Ryanair in the year to 31 October 2018. On Monday, O’Leary denied that the airline was short on pilots and downplayed reports that workers are leaving for competitors like Norwegian Air. He repeated today that the more than 2,000 cancelled flights will cost the airline about €25 million. With reporting by Cormac Fitzgerald. Email “Ryanair wants to prevent further flight cancellations - by taking back pilots' holidays”. Feedback on “Ryanair wants to prevent further flight cancellations - by taking back pilots' holidays”.